FRONTLINE Spray can be used on puppies and kittens 8 weeks of age or older and provides a quick and effective way of eliminating large flea and tick infestations already on your animal. 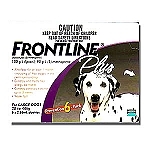 FRONTLINE Spray is ideal for reducing and controlling fleas and ticks in multi-pet households. With severe infestations, many vet clinics will apply fast-acting FRONTLINE Spray to your pet right in the clinic and then recommend at-home follow-up with the long-lasting control of FRONTLINE Plus or FRONTLINE Top Spot®. Please read the following instructions carefully before applying FRONTLINE Spray to your pet. Wear household latex gloves. Hold bottle in upright position. Ruffle your pet’s coat with one hand while applying spray mist to back, sides, stomach, legs, shoulders and neck. For head and eye area, spray FRONTLINE Spray on a gloved hand and rub gently into your pet’s hair. Do not get this product in the animal’s eyes or mouth. Apply spray mist until the hair is damp to thoroughly wet. Approximately 1 to 2 pumps per pound of body weight will be required. Animals with long or dense coats will require the higher rate. As with any flea control product, wash your hands and exposed skin thoroughly with soap and water after use. To prevent flea build-up or reinfestation, use FRONTLINE Brand products prior to the onset of flea season and monthly thereafter. Do not reapply for 30 days.